Electricity generation with the use of secondary energy resources emerging as a by-product of industrial technologies is one of the promising lines for making the Russian power industry more efficient. The secondary energy resources produced during operation of some industrial installations (primarily the heat of high-temperature gaseous waste) have a significant potential for electricity generation. Apart from being efficiently used, this potential can also be further increased by subjecting the thermal and material flows of gaseous waste to integrated power and chemical accumulation on the basis of natural gas endothermic conversion reactions, with the high-temperature gaseous waste serving as an oxidizer and a heat source for the conversion. 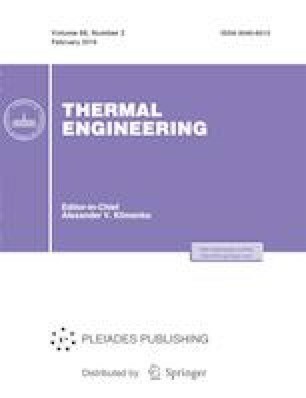 Mathematical models of industrial installations equipped with conversion reactors for carrying out integrated power and chemical accumulation are developed and investigated. An oxidizer consumption coefficient for the conversion process is used in the models, and the method for calculating it is described. The increase of secondary fuel chemical energy obtained for an industrial fuel installation in comparison with the converted natural gas is quite essential, making around 14%. With such an arrangement, the entire flow of gaseous waste becomes a high-quality secondary fuel. At the same time, the possibilities of decreasing the consumption of oxidizer for the conversion process to the optimal value equal to 1.0 are rather limited: its level should be no less than 3.0. The use of integrated power and chemical accumulation under the conditions of a fuel-free basic-oxygen converter is possible with the oxidizer consumption ratio for the conversion process down to 1.4, a level closer to its optimal value. The possibility to recycle in the integrated power and chemical accumulation process approximately 32% of the heat of gaseous waste with the entire mass flowrate of converter gas transformed into high-quality secondary fuel with a heat capacity of 2155°С is demonstrated. The use of integrated power and chemical accumulation in the basic oxygen furnace technology can make it possible to obtain an essential gain in the electricity generation potential in comparison with the direct use of natural gas for electricity generation purposes. The article was prepared with support of the Russian Federation Ministry for Education and Science as part of fulfilling the state assignment within the framework of competitive selection of scientific projects accomplished by the scientific teams of research centers and scientific laboratories at higher education institutions (application no. 13.3233.2017/PCh).